Winx continues to break records and the champion mare continues to break the clock. 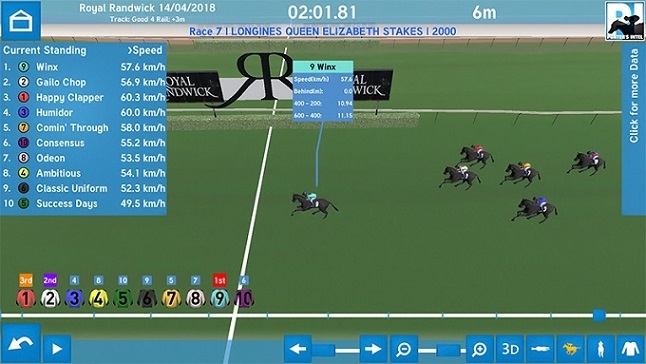 Just as it looked to the eye, Punters Intel reveals Winx was in a world of her own from a sectional perspective in the Group 1 $4m Longines Queen Elizabeth Stakes (2000m) at Royal Randwick on Saturday. The race was completed just 1.35 seconds slower than the Randwick 2000m course record so they didn’t crawl up front and the official last 600m was 34.62. Winx though, coming from last, clocked 33.48 for her last 600m and it was the 400m-200m section where she had them beaten. She was the only horse to break 11 seconds, running 10.94, in any portion of the race. From there her 11.39 final 200m was 0.19 seconds better than anything as she raced into the history books. Add to that she covered an extra 16.1m! Third placed Happy Clapper again confirmed he’s at the top of his game with the second best last 600m of 34.27 and last 200m in 11.58. There was a lot of interest in the runs of the two favourites in the South Pacific Classic (1400m), namely Isaurian and Renewal. And their tale can be told looking at the Punters Intel data from the first 400m of the race. Renewal (13.41) and Isaurian (13.43) were clearly the fastest out of the gates and they went on with it in the next 200m split where they burned 10.88 and 10.90 respectively. By the finish they had nothing left, especially with Waimea Bay (11.10 from 800-600) putting it to them midrace, and Renewal’s 35.11 and Isaurian’s 35.06 were among the slower final 600ms of the race. Speaking of forgive runs, the Group 2 Arrowfield Sprint (1200m) is a case of what might have been for Viridine. To the eye you could see he wasn’t tested and you have to wonder what he had in the locker if he was able to be let down. Punters Intel revealed his last 600m was an excellent 33.83 when compared to the winner Catchy’s 33.17 given he had no open space and she was able to sail home unimpeded. From the 400m-200m Viridine clocks 10.94 (Catchy 10.68) and he still ran 11.61 for his last 200m (11.32 Catchy). We’ll never know but it might have been one that got away. The Sydney Cup proved to be a gripping affair in the last 200m with Zacada stealing an inside run to hit the lead and Who Shot Thebarman looping the field and chasing him down on the line. What the data does show is, while the margin was a nose, Who Shot Thebarman covered an extra 13.4m in the run than Zacada. Alizee’s booming finish to win the Group 1 Coolmore Legacy was something we haven’t seen from her this carnival until now and her 33.60 last 600m was more than half a second faster than her rivals. That second fastest was Nettoyer who clocked 34.11 in finishing midfield. Don’t miss Punters Intel with Gerard Middleton, Brad Davidson and Brad Gray at 7pm on Tuesdays on Sky Thoroughbred Central. Click here to download the Punters Intel app.